The volume is divided into two parts, one on each alliance. An introductory essay by S. Victor Papacosma spells out the themes addressed in the individual essays and the volume’s coherent historiographical contribution. They include, but are not limited to, military and political matters, the consequences of World War II for the non-Western world, the role of individuals in shaping historical events, and the unintended consequences of policy choices and developments. The international group of contributors brings to bear considerable policymaking and academic experience. 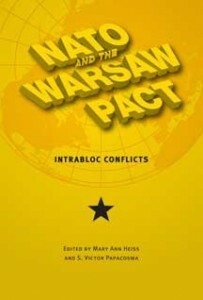 In approaching the Cold War–era alliances from a new angle and in drawing on recently declassified documentation, this volume adds to the literature in recent international history and will be of interest to scholars in such fields as U.S. foreign relations, European diplomatic history, and security and defense studies, among others. Visit the Parallel History Project on Cooperative Security site for more information and news related to NATO and the Warsaw Pact. Mary Ann Heiss, a specialist in the history of U.S. foreign relations with a particular emphasis on Anglo-American relations, is associate professor of history at Kent State University. Her publications include Empire and Nationhood: The United States, Great Britain, and Iranian Oil, 1950-1954 (1997); coedited volumes on the recent history/future of NATO and U.S. relations with the Third World; and numerous essays in edited collections and professional journals, including the International History Review and Diplomatic History. S. Victor Papacosma is professor of history and director of the Lemnitzer Center for NATO and European Union Studies at Kent State University. He has published extensively on Balkan issues, particularly on twentieth-century Greek politics and security issues. He has coedited seven volumes of Lemnitzer Center conference proceedings and is currently serving as executive director of the Modern Greek Studies Association.